The Stig is a single-layered collar best fitting dogs whose necks measure 12 to 16 inches. 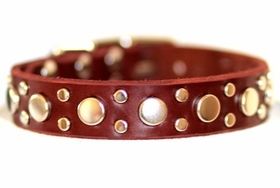 Available in 3/4" and 1" widths, this collar is decorated with flat top studs of two sizes, 1/2" in the middle of 1/4" studs. Choose from silver or brass hardware, and 5 leather colors. All of our collars are handmade using find quality materials in the U.S.A.